Georg Peter Klaus was born in Norka, Russia on October 11, 1890. Peter was married in Norka to Amalia (Molly) Fink. The Klaus family migrated to Canada, arriving in Quebec aboard the steamship "Ansonia" on November 13, 1911. 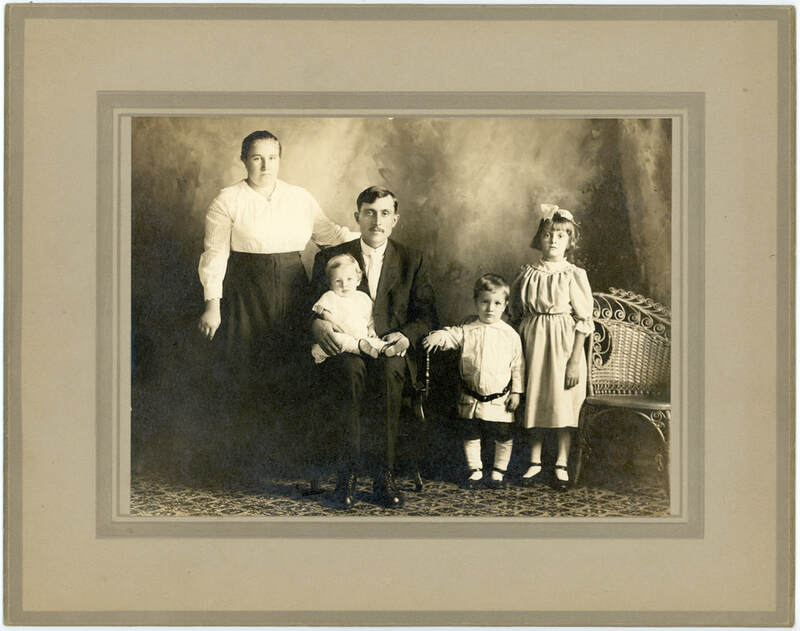 Settling first near Edmonton, Canada the family soon immigrated to the United States where they arrived in June 1914. Their new home became Portland. By 1917, Peter was in the garbage business with an Italian partner and he lived at 3634 NE 13th at the intersection with Beech. Peter was well known as the neighborhood banker and many people went to him for loans rather than going to a commercial bank. He held the trust and respect of all who knew him. ​Peter also served as the Treasurer of the Zion German Congregational Church. Peter died on August 17, 1967 and he was buried at the Rose City Cemetery. Written on back of photograph: "Peter & Molly Klaus - Mary, John, William". The photograph was likely taken in Portland, Oregon about 1917 and belonged to Jacob K. Klaus. Courtesy of Lynn Huber and Lois K. Klaus. Lois Klaus, niece of Peter Klaus, August 2015. Marcia Staunton, email dated June 17, 2012.